Our Surveyors have carried out many, many surveys using our Victorian and Edwardian survey templates. Traditional Victorian style architecture with its typical styles such as Italianate or Renaissance and Queen Anne or Medieval/Gothic with elaborate detailing and steep roofs are all featured in our database of survey templates of this Era. The Edwardian period from 1901 to 1918 with its buildings with less ornate decorative features than the Victorian era with lighter colours and the emergence of the Arts and Crafts Movement with simplicity of design again are all covered in our Era templates. Phone 07584 066048 for example surveys of properties built in the Victorian and Edwardian eras or click below to download some Victorian example surveys and Edwardian example surveys. Our Victorian/Edwardian survey templates include many unique survey sketches appropriate to this Era of property including the adjacent mansard roof sketch. 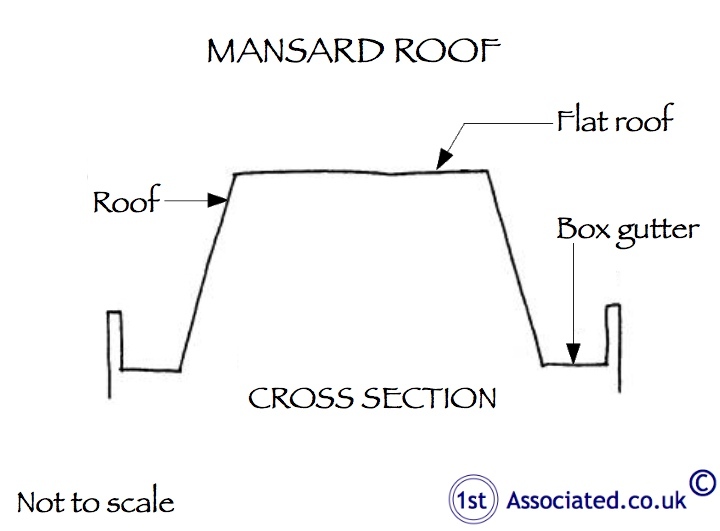 Mansard roofs characteristic of the French Renaissance architecture and later a popular style of roof from the 1860s through to the 1880s. Call us or email for more hand drawn sketch examples.